(SPECIAL PRICE). Hello everyone! SPECIAL PRICE ! STARTING PRICE SPECIAL. The object for sale is ONE item (unless otherwise indicated). Every buy-it-now is for one Amiibo. Many Amiibos are being reprinted. The only difference is the box. You may see the 1st, 2nd, 3rd prints in the pictures. As I said though, you will only receive 1 Amiibo at RANDOM, depending on what's available. Up for sale is a new, sealedRosalina amiibo from the Nintendo Super Smash Bros. series. The serial # is 464S1 (1st print). - New (unused, sealed). I’ve taken pictures of the front, back, left, and right sides. 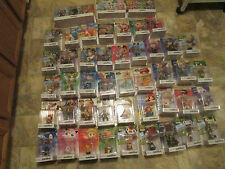 AMIIBO-LOT of 12 SMB figures. Includes all characters in the photos. Waluigi, Wario, Boo, Bowser, Yoshi, Rosalina, Donkey Kong, Diddy Kong, Mario, Luigi, Peach, and Daisy. All US Version. All Brand new in box. Cared for by serious adult collector. One owner. Smoke-free, child-free, pet-free home. Will ship globally through ebay global shipping program. Ships well-protected. 100% feedback over 15 years on ebay so buy with confidence! Thanks! All of the Amiibos in this lot are IN MY OPINION in excellent condition. In a few months, these Amiibos may be worth double or more. For sale is this huge lot of Amiibos. Other missing Amiibos are available in my insertions. Rosalina and Luna. Specifically, the following amiibos are included. They are in good condition overall with minor wear from normal use. The amiibos arecompatible with the Nintendo Switch, Wii U, and 3DS. Sale for Super Smash Bros. Rosalina Amiibo. dents in plastic or other defects. Nintendo amiibo ROSALINA & LUNA from the Super Smash Bros Ultimate series. NINTENDO ROSALINA AMIIBO . Condition is New. Shipped with USPS First Class Package. AMIIBO ROSALINA No 19 SUPER SMASH BROS SEALED ! Rosalina Amiibo luma Super Smash Bros Series Nintendo Switch Wii U 3DS *NEW. Condition is New. Shipped with USPS First Class Package. Rosalina No. 19 Amiibo - Super Smash Bros Series. Sealed Amiibo Only. For Nintendo Switch Wii U & 3DS Console. See photos for details of the actual item.